We begin our guided bike ride in the town of Bedoin, international hub of cycling for all things Mont Ventoux. We cycle up the seldom-used and peaceful Gabelle road to the east, climbing gradually through scenic forests. We reach the village of Sault -- and its famous nougat specialty -- perched high above the vast lavender fields , before reaching the tiny village of Monieux. From here we descend what is probably the most spectacular road in all of Provence: the Nesque gorge. The narrow road hovers above a breathtaking canyon, winding ever-so-gently downhill along an improbable canyon road, through tunnels carved directly into limestone cliffs. Lunch in Monnieux or in Sault .. depends on our pace. After the long and winding descent we return to the plains and make our way back to Bedoin to complete our loop. Wine tasting on the way back to Bedoin. Monday morning is the morning market day in Bédoin! Make sure to check out Bedoin's Monday morning market before you meet your guide and start your day ! 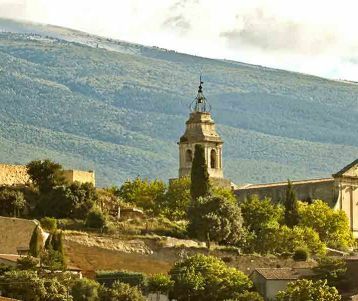 We begin our guided bike ride in the town of Bedoin, international hub of cycling for all things Mont Ventoux, and made famous by its many inclusions in the Tour de France bicycle race. 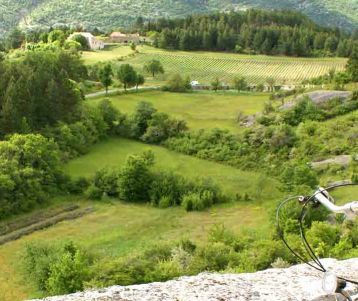 We cycle eastward through the cherry orchards to the village of Flassan, and then up the seldom-used and peaceful Gabelle road to the east, climbing gradually for 10km through scenic forests. We reach the eastern flanks of Mont Ventoux. 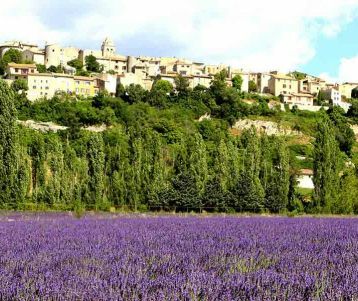 A detour is possible up to the perched village of Sault, surrounded by its lavender fields, where we can try some of its famous nougat candy. Circling back to the west we reach the tiny village of Monieux. Lunch in Monieux or in Sault .. depends on your pace. 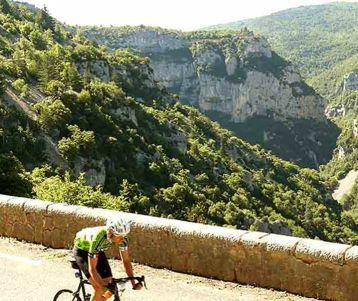 After a short climb, we find ourselves high above a spectacular canyon, and then a freewheeling descent ensues on what is probably the most spectacular road in all of Provence: the Nesque gorge. The narrow road hovers above a breathtaking canyon, winding ever-so-gently downhill along an improbable road, clinging to the side of a cliff, through tunnels carved directly into limestone: jaw-dropping scenery guaranteed! After a long and winding descent we return to the plains. We enjoy a wine-tasting at a local estate (depending on opening days) and make our way back to Bedoin to complete our loop. The total ride is 80 km is length. The sustained climb at the beginning of the ride -- 15km long -- is gradual but suitable for those with biking experience on hills. Don't forget the possibility of using E-bikes to make the riding easier (with a supplement)!